The Japanese Society of Neurology (JSN) held its annual meeting in the state-of-the-art Tokyo Forum May 29-June 1. There were 6,713 participants. The meeting was primarily in Japanese with enough English language sessions to make a non-Japanese speaker fully occupied with excellent sessions from Japanese and invited speakers. There were many highlights throughout. The inclusivity and international openness of our Japanese colleagues as well as their willingness to open up and collaborate with neurologists from across the globe were exemplified in organizing a Symposium on Developing Neurology in the World. This was the brainchild of Professor Hidehiro Mizusawa, president of the JSN and the congress. Following consultations, five invited speakers in addition to our host participated. The regions represented were Asia, by Man Mohan Mehndiratta (India), president of Asian Oceania Association of Neurology (AOAN) and WFN regional director; Africa represented by Amadou Gallo Diop (Senegal), co-director Africa Initiative WFN; South America represented by Renato Verdugo (Chile), president of WCN 2015; Central America represented by Marco Medina (Honduras), regional director WFN; and me representing Europe and international collaboration. The meeting was co-chaired by Ryuji Kaji (Japan), head of the Asia WFN. The symposium was honored by the attendance and participation of Professor Jun Kimura, past-president WFN. The meeting was opened by Ryuji Kaji with comments on the situation of neurology in Japan and the WFN Asia Initiative. This was followed by Hidehiro Mizusawa, who gave a historical perspective followed by an impassioned commitment to internationalization: “It is quite important we are communicating constantly and simultaneously with other countries and other peoples, and appreciate other ways of thinking around the world. This is internationalization.” Mizusawa talked about the collaboration with AOAN, EANF (East Asia Neurology Forum), AAN and WFN. I presented the current status of the EFNS training. The EFNS has 45 member societies plus nine associate member societies. The European Board of Neurology (EBN) is under the umbrella organization of the European Medical Specialists Board (UEMS). This represents 34 countries and holds board examinations in English. The latest was in Stockholm in September 2012 with fellowships to those candidates from the EU and diplomas for those from outside the EU. The curriculum and the examination are well structured and quite advanced. There was a lot of interest from the audience in the way it has been organized and conducted. The EFNS has many other activities not only in Europe but also in the Mediterranean basin and Africa. These take many shapes including teaching courses. The next one was in July in Senegal in collaboration with the WFN and IBRO. Many other activities were discussed including fellowships to junior and senior neurologists as well as the department-to-department program. Electronic teaching, e.g. eBrain, is another excellent resource. This is available free to all low and lower-middle-income countries across the world. The global scene is still lagging and the vast discrepancies in neurological training and specialization are there for all to see. This is exemplified in the WHO neurology atlas, which was published jointly with the WFN in 2004. A second edition is in progress. The WFN’s role in training is a prime function of the organization. This has been carried out in accreditation and certification of training programs; site visits; and advice on setting up training with subsequent accreditation and certification. The ultimate goal is to create Regional Boards of Neurology under the auspices of regional directors and their councils. The Asian view was presented by Man Mohan Mehndiratta. Asia is the largest continent with a population of 4.2 billion. Neurology is growing across the region at a varying pace. Neurology training is not harmonized, and the Indian experience was detailed. The establishment of the Indian Academy of Neurology (IAN) in 1991 has resulted in a huge advance in training and research. The programs in Australia/New Zealand, China, Japan, Singapore, Indonesia, Philippines, Malaysia, Thailand and Korea were mentioned, and the possibility as well as the utility of an integrated program were discussed. Asia is the largest continent with a population of 4.2 billion. Neurology is growing across the region at a varying pace. Neurology training is not harmonized, and the Indian experience was detailed. The success story of AOAN in establishing its organizational structure and operational pathways has to be highlighted. This happened primarily because of the enthusiasm and diligence of regional neurologists. The WFN helped in seeding the process, and the success was cemented following that June 2012 meeting in Melbourne. This was an example for all to see, the full support of Australia/New Zealand society ANZAN with their Asian colleagues being instrumental in the development of the regional organization. Africa and its needs were presented by Gallo Diop. His insights and intimate knowledge of all parts of Africa was detailed. The population of 1 billion is not served well at all. With life expectancy of 53 years and 42 percent of the population less than 15 years old, the task is daunting. The huge treatment gap with a low number of neurologists is a major problem. 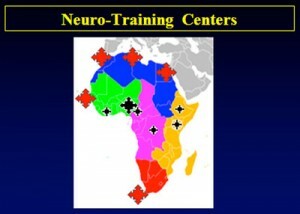 Neurological training is limited to the North and South with few in the Sub-Saharan region. (See Figure 1.) The locations in Red are those who train Africans from outside their own country. “African neurologists must be trained in Africa,” Diop said. A short complementary period spent in a center outside Africa is additional. This is where the WFN can help in setting up and supporting within-Africa training and short placements in subspecialties following certification. 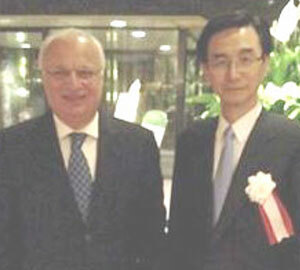 Raad Shakir (left) and Hidehiro Mizusawa. Renato Verdugo presented the current status in South America. The training programs are few, and the percentage of neurologists among medical practitioners is small. 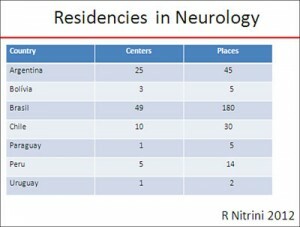 The location and spread of neurological residency training programs in Neurosur countries (see Figure 2) shows the dearth of such opportunities and the need for more integration. This is probably, in a way, easier as we are dealing with two languages in the whole region. The need for integration and exchange programs is essential. Marco Medina presented the Central America perspective. The training programs in Guatemala, Cost Rica and Honduras were presented. The Honduras program is a success story of the collaboration of the Honduran Neurological Society and the WFN. The issue of the process to try to establish a Pan American Federation of Neurological Societies (PAFNS) was presented. Congresses have been held every four years, and there is as yet no established regional organization. The process started at the WCN in Marrakesh and is continuing. Integrated training across the region is the ultimate goal. 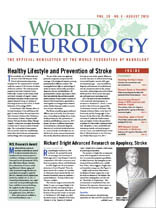 One cannot forget the role of major organizations in developing neurology across the world. The American Academy at its annual meetings and programs is a major source of education and contributes to the spread of neurological science and practice. The collaboration was indeed mentioned, as was the academy’s generous contribution to WFN activities including the use of Continuum as an education tool which continues to flourish. To conclude, there are many daunting and huge needs across the world. Our Japanese hosts were most thoughtful in holding such a gathering to look at the issues and try to intervene when and where feasible. This is commendable and welcomed. There are, however, many success stories; the phenomenal success of the EFNS and its regional and international involvement is an example to follow. The AOAN success in its organization is a step in the right direction, the African needs and the way the continent is trying to organize its affairs is impressive as well as the South/Central American efforts to establish their institutions and policies. Neurology can only progress with such exchange of ideas and by creating the building blocks for the practical implementation of policies. Shakir is Secretary-Treasurer General of the World Federation of Neurology.